The word ‘Sari’ is the first thing that comes to mind when we talk about Indian clothes. The world knows that. We have seen numerous Americans and celebrities from across the world donned in a sari during their India visit, be it Oprah Winfrey or Paris Hilton. No other garment in the entire world is as intriguing as our Sari is. Intriguing because it is 7 to 9 yards of unstitched material. Intriguing because of the way it is worn, pleated and twined around the body, exposing a women’s midriff. Intriguing because of the numerous ways in which it can be worn, some say over 50. Intriguing because of the innumerable different kinds of fabrics used to make it. Intriguing because of the exquisite, intricate & the variety of work that is done on it. Intriguing because it’s pattern can uniquely represent the state that it comes from. Intriguing because of the latest fashion trend that it inherently represents. To add to that, is the blouse that is worn with it. The blouse that makes its own contribution to the fashion trends in terms of colors, styles and fabrics, just as much as the Sari. More recently, you can tell the decade by looking at the style of sleeve and neckline of the blouse even. Lately, the petticoat that the Sari is worn over, has been seen to gain visibility as well, both literally and figuratively. As more and more see through mesh saris have been gracing the market, the petticoat has evolved into a richer, softer version, completing the fashion package. As far as the history of the Sari goes, its existence can be tracked as far back as the Indus Valley Civilization (2800-1800 BC). The various Hindu temples in India dating back to the 1st century depict goddesses wearing saris tied in a ‘fishtail’ style. Over the years, the Sari took various forms, from being worn as a garment for lower body with a top band and scarf around the neck or over the head- as we have grown up seeing in ‘Amar Chitra Kathas’, to its’ current form that has been around for hundreds of years. The essence of it being maintained over the years, which is that a Sari is an unstitched fabric draped around the body in various styles! And if you look at traditional clothing from other cultures, say the Japanese Kimono or the Swedish Kilt, it’s apparent how these evolved into near obsolete. And so it is safe to say that no other cultural clothing in the world has withstood the test of time as has our Indian traditional clothing, the Sari. after hastily tying a sari around her in a movie). The girl in the sari is the conventional “bahu-worthy” loved by the in-laws (thinking of ‘Cocktail’ from recent times) or the “super-woman” house-wife that manages everything around the house including serving hot fresh rotis to the family (thinking of Sridevi in ‘English Vinglish’). On the other extreme, Hindi movies have even shown sari as a tantalizing garment that our heros find hard to resist. The fact is vastly highlighted by making the sari all wet in pouring rain, adding to the sensuality of the woman and the sari, and also adding to the poor guy’s misery (thinking of Akshay Kumar and Kajol in ‘Yeh Dillagi’ and numerous others, for that matter). Also, there’s a certain amount of type-casting shown in the movies that almost accurately reflects real-life, for instance a woman politician seen in khadi saris, air-hostesses and sales women in crisply pleated silk saris, etc. Bollywood's contribution goes beyond the movies though. India's top designers like Manish Malhotra, Ritu Kumar, Sabyasachi Mukherjee, etc design alluring saris for the gorgeous actresses like Aishwarya Rai, Kareena Kapoor and the likes. Sari is and has been an integral part of our culture, woven and intertwined with the essence of a woman and her personality, depicted in our epics and our movies and shown off in our ceremonies and our festivals. Young woman of today might not find the garment comfortable for every-day wear, but love our sari we do! After all, it’s India’s contribution to the global garment culture. We love our saris. We have already established that in the "Ode to Sari". However, we don't get enough opportunities to don this alluring 7-yard long Indian traditional garment. Unlike our mothers who wore saris on a daily basis, we find the non-traditional attire more comfortable as we run around all day, or perhaps I should say drive around all day. Keeping in mind our lifestyle, whether in India or abroad, it is no surprise that we have steered clear of sari as a regular attire. Of course, those of us women who live outside of India have even lesser opportunity of wearing sari as the sari events are restricted to Indian festivals and other Indian traditional events. 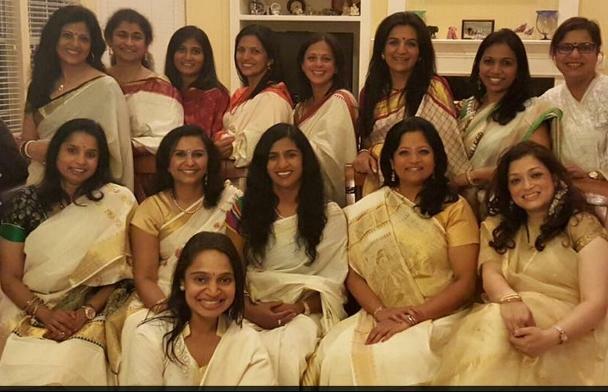 We often depend on parties where the host makes the call for all women to wear saris. Most ladies are happy to oblige as it gives them a chance to "air" their saris. When Kalyani Bhat of Texas, organised a Haldi- Kumkum party for the ladies in her Bunco group (ladies game night group) on March 24th 2015, she requested all her friends to come in red, yellow or orange colors, the colors of haldi (tumeric powder) and kumkum(red dye, vermillion, traditionally used by Hindus to put on the forehead). The event gave all her friends an opportunity to take out their old saris. Everyone had a story to tell about the sari they were wearing. The surprising fact that emerged was that most of those stunning saris were about 20 years old- now that is precisely why sari is ageless! It was a fun event as the ladies exchanged stories of the sari they were wearing. As each one came in, Kalyani applied tika on their forehead and gave them parsad (religious offering). The dinner was special as well. Of course, everyone wanted the recipes of the Maharashtrian delicacies that included Tomato Saar, Vatli Daal, and Shrikhand among other items. Plus, everyone got little goody bags containing traditional trinkets to take home! Kalyani, who has taught religious classes in the local temple, explains that Haldi Kumkum or Haldi Kunku (as called in Marathi) events are popular social events among the ladies of Maharashtra. It is traditionally celebrated among married women, where they exchange Haldi and Kumkum, which is a symbol of their married status. Keeping in mind the changing society, all women (single or divorced) are now included in this social gathering. Sankrant Haldi Kunkus are done in the beginning of the year. Black is the most popular color for Sarees worn for this Haldi kunku. Til ( sesame) sweets, gul poli and halwa ( white sugared sweets) are distributed. This occurs around the Marathi new year, Gudi Padva. Kairiche panha( raw mango drink) and vatli dal( Amba dal) are the two popular menu items for the Haldi Kunku along with sweet coconut karanjis. Gifts are given including bangles, toe ring, bindis and small novelty items along with fruits, nuts and rice. Rice symbolizes auspiciousness, prosperity and fertility.Mother's Day is a day to honor our mothers for the love that they bestow, the care that comes unconditionally, the sacrifices made in a second, the stories shared over the years, the support supplied every second and for the countless other selfless acts that they do and for the words that they say to encourage, support, understand or simply to humor us. Our childhood memories of our mothers involve innumerable times that she catered to our needs, stood up for us, gave in to our whims and also how wonderfully beautiful she looked while doing all of that. We can always conjure up an image of hers during our early years. Those images in our minds, for many of us, are memories of her donned in a sari. That takes us to the gorgeous, elegant, intriguing Indian garment- the sari. What better day for an ode to the sari than Mather's Day? 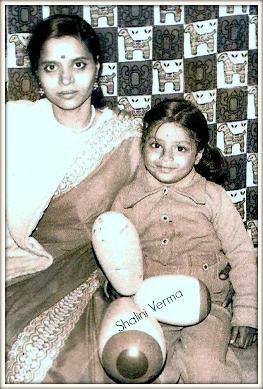 Here we have few of the pictures that Indian Americans have shared of their mothers in 1970s and 1980s. Our ode to the mothers of that era, the last generation of Indian women who wore sari as an everyday garment, our ode to sari!